You may have heard of the Festival of Lights held in Berlin every October. Or maybe Diwali, the ancient Hindu festival of lights comes to mind. Hawaii has its own variation on the theme too. But in Montreal, the celebration of lights in the dark of winter is called Montréal en Lumière (Montreal in Lights) and it's totally different. Organizers coordinate the display of light installations in key downtown locations and on select building façades. The event includes fine dining events, live performances, free all-night activities, and more. For 2019, Montréal en Lumière runs from February 21 – March 4. The focal point of Montréal en Lumière is Place des Festivals' 6,141 square meters (66,101 square feet) of public space adjacent the city's performing arts complex Place des Arts and Montreal's chief contemporary art museum. Innovative and unexpected light installations are part and parcel of the experience but there's more than lights to the festival of lights in Montreal. Continue to 2 of 7 below. 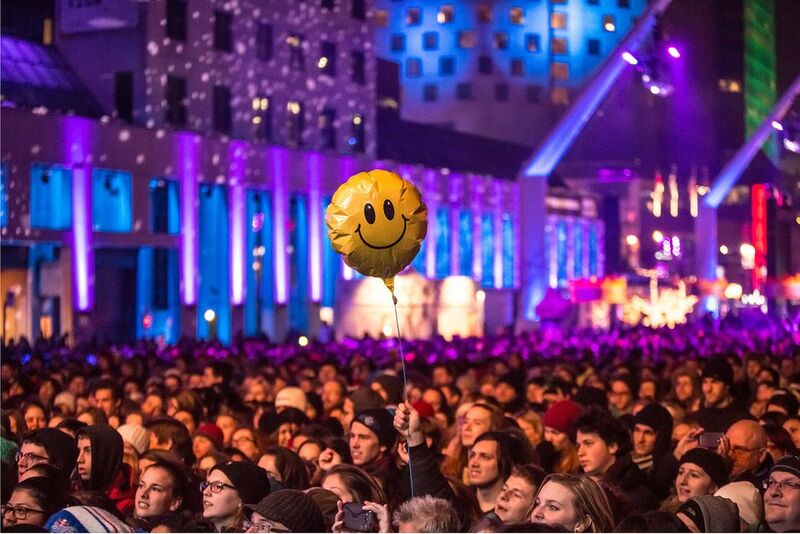 An integral part of Montréal en Lumière's programming lies in and around the festival of lights' outdoor site located in Place des Festivals' public space. The outdoor site also spills out onto Ste. Catherine Street and Place des Arts' adjacent plaza. Local DJs, live concerts featuring local French music artists, an ice slide 110 meters (361 feet) long and a zip line spanning two city blocks allowing festival-goers to zoom over the outdoor site are the leading attractions. In 2019, the outdoor site is open February 21–March 4 with the bulk of the fest's free entertainment and activities scheduled on Thursdays, Fridays, Saturdays, and Sundays. Free curling, free zip lining, illuminated art, and more, at ground level, you can roast your own sausages and marshmallows on an open fire because... why not? There are also gourmet food stations selling everything from soup to maple products to cheese fondue. Continue to 3 of 7 below. Montréal en Lumière might be about lights, but it's also about food. Lots of food. The Festival of Quebec Cheeses is just one of the festival's gastronomic attractions. This free event is held across the street from the Montréal en Lumière outdoor site, at Complexe Desjardins. It's cheese tasting on a grand scale with the chance to try over 60 different Quebec cheeses made by 20 different producers. Once you find a cheese you love, you can purchase some to take home. In 2019, the Fête des fromages d'ici runs February 21 through February 23. Continue to 4 of 7 below. Nuit Blanche is easily the biggest attraction linked to Montréal en Lumière, one held the last Saturday of the festival that involves more or less 200 free activities that stretch out until dawn. It's very popular so be prepared for lines. In 2019, Nuit Blanche is held on March 2 running into the wee hours of the morning. It's fun, festive, and can be exhausting. These Nuit Blanche tips will help you plan for a great one. Usually debuting the same night as Nuit Blanche, Art Souterrain is an annual event devoted to underground art. The entire event is set in Montreal's Underground City, one that features anywhere from 75 to over 100 art installations throughout the city's subterranean corridors. In 2019, Art Souterrain runs from March 2 to March 24. The best day to walk the circuit is during Nuit Blanche itself since there are volunteers stationed at every installation to help folks navigate and to explain the ​backstory of each installation. Continue to 6 of 7 below. So Montréal en Lumière does lights. It does food too, notably cheese. But it also delves into music, offering free concerts most if not every evening at Montréal en Lumière's outdoor site. Artists tend to be local French language musicians. As for bigger international names, they're far more likely to be scheduled on the paid concert roster. Check Montréal en Lumière's website to see the full lineup of who's performing at this year's edition. Continue to 7 of 7 below. Last but not least, Montréal en Lumière proposes themed fine dining evenings with dishes prepared by guest chefs flown in from various regions around the world. Each edition usually spotlights a Quebec region. Check Montréal en Lumière's website to make reservations at one of this year's fine dining events.